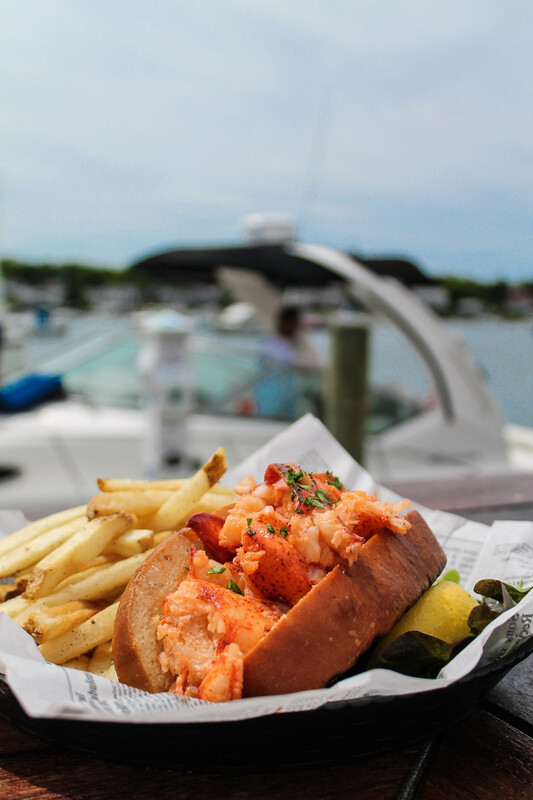 Lobster Rolls on Martha’s Vineyard are a must during the summer and today I’m sharing this blog post where I am listing where you can get delicious lobster rolls on island. It is my duty to you, as a year round resident and chef on island, to taste these lobster rolls – the good and the delicious, and share them here! Let’s start with my favorite lobster roll on Martha’s Vineyard: The Right Fork Diner Cold Lobster Roll! The Right Fork Diner is located on Katama Airfield and is a spot that has fond memories for me – just a spot my husband and I, plus friends, would stop in for breakfast or lunch through the seasons. Honestly, I’m happy it is my favorite lobster roll. The environment here – because you’re outside and in the open, watching biplanes take off, is just stellar. Why I loved the Right Fork Diner Lobster Roll: the brioche bun was generously slathered in butter and very nicely toasted and the roll was served with a fresh salad of tender greens, which is the ideal side to a hearty roll. What made this the best in my opinion was the fact that the lobster salad had FLAVOR. An herb aioli lightly coated the sweet tender lobster meat and this made all the difference. Most other restaurants somehow pride themselves in only having mayonnaise and lobster, but they just need a little help from some citrus and herbs, like this one here. The Right Fork Diner does an incredible job – such a good job that they also sell a hot lobster roll with a drizzle of the same herb aioli, making it the runner up of my tasting. Stay in Edgartown and head to the Harbor View Hotel for the lobster roll with the best view of the Edgartown Lighthouse – the lobster roll at Henry’s! This is one incredible roll, served on a brioche roll and packed to the brim with lobster meat. They only sell a cold lobster roll and that’s okay! Unlike others with just mayonnaise, Henry’s coats their lobster meat in remoulade and tops everything with fried capers, which gives the roll a little extra flavor and I loved that! Between the remoulade and the fried capers, this lobster roll in Edgartown has great flavor. I suggest ordering one to go and walking down to the lighthouse. 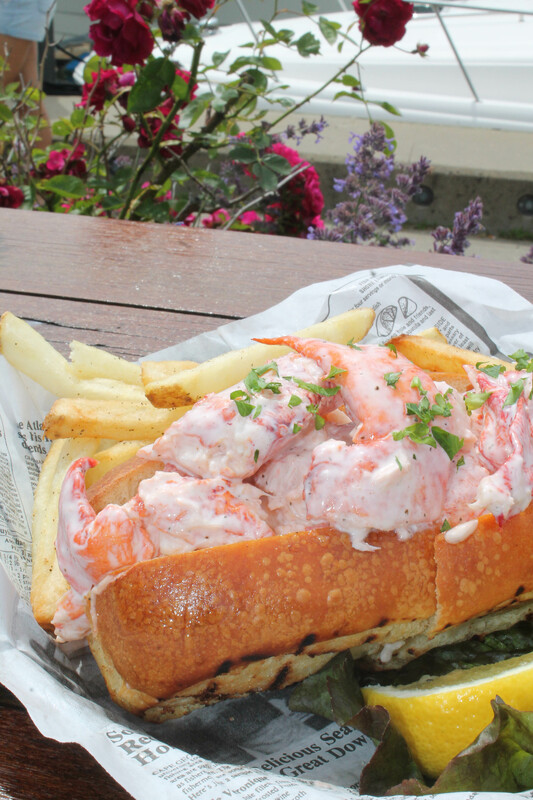 Settle on your beach blanket on Fuller Street Beach and enjoy in one of the Vineyard’s best lobster rolls. Up next, head to Oak Bluffs and grab a seat overlooking the Oak Bluffs Harbor. You’ll watch the ferries come and go, plus the people watching here is some of the best. Lately, I’ve asked a few people what their favorite restaurant on the island was and more than a few have replied with “the Lookout” and this is where our next lobster rolls came from. Another spot that makes both a hot and a cold lobster roll, I knew the fame it had – it was said to be huge in size and very delicious. The hot lobster roll at the Lookout Tavern arrived and it sure was insane. They only use knuckle and claw meat so what you’re getting are huge chunks of lobster meat, tossed in melted butter and tucked into another toasted and buttered brioche roll. The lemon wedge served with it makes everything bright and delicious. This was the slow start of me realizing I loved hot lobster rolls as much as cold ones. How I got so lucky to capture the Steamship Authority ferry in the back of this photo is beyond me, but the Lookout Tavern’s cold lobster roll might just be as good as their hot one. I appreciated the bit of lettuce and the lemon wedge, which added contrast to the mayonnaise tossed lobster meat and the buttery roll. Go for the lobster rolls. But if you want to just go for drinks, that’s okay too. 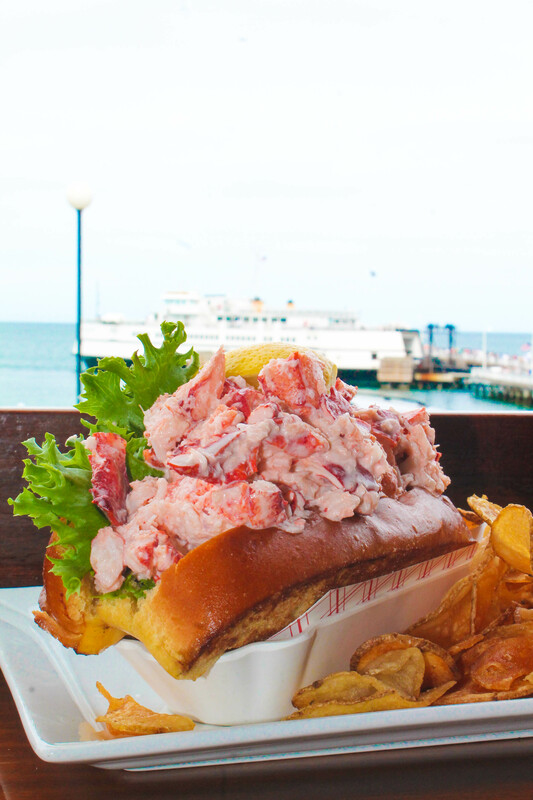 The view here is too good to pass – but a lobster roll makes that view just a little better, don’t you agree? Stay in Oak Bluffs and try the lobster rolls at The Sand Bar & Grille. Also a spot that offers both a hot and a cold, they make thousands of these a season because honestly, nothing beats this other view. It’s another look at Oak Bluffs Harbor but now you add the fact that you can sit and have your feet in the sand – that’s why it’s called the Sand Bar! I find it to be such a fun spot to go in the summer – even though it’s always packed to the brim, the atmosphere is fun and exciting, there’s always something going on. My favorite of the two was the one below, the cold lobster roll. There was something about the mayonnaise that I loved – and I forgot to ask what kind they used, so I need to go back! The kind of mayonnaise each establishment uses varies, thus the difference in flavors. Most spots in Martha’s Vineyard used either Hellman’s Extra Heavy, Duke’s, or Cain’s. Back to this lobster roll, it was served with fries and I honestly don’t know who would be able to finish this meal. The roll is huge! For a beach vibe in Oak Bluffs, head here for a roll. We’re going back to Edgartown for a few more rolls, this one first from Katama General Store, which we picked up and brought to the beach. Lobster Roll Tip: When bringing lobster rolls to go, ask for the lobster meat to be packaged separately so that the roll doesn’t get soggy! Once at the beach, we prepared the rolls with a bit of lettuce and were ready to go! A hint of celery in the lobster salad added great crunch and was a good pairing to round out the lobster roll. Not only that, but Katama General Store is hands down the best and only beach bodega on island – this is the place we always stop for eats, snacks, drinks, and any other beach essentials. Looking for a hip spot in Edgartown to grab a lobster roll? Even though Behind the Bookstore is mostly known as a coffee shop, they also serve up a tasty lobster roll. Albeit smaller than every other roll we tasted, the fresh lobster meat was tossed in a lemon tarragon dill aioli and drizzled with a warm brown butter caper sauce. If that doesn’t translate to flavor, I don’t know what does! Served with house chips and a New England style hot dog roll (unlike the other buttered brioche rolls), this was one tasty roll! Now, head to Vineyard Haven for more lobster rolls! If it’s Friday and it’s 4pm, you make sure to make your way to Grace Church for their ever so popular lobster rolls. We arrived around 3:45pm and the line was already out the door, so make sure to get there early. They are open until 7pm, but tend to sell out way faster than that. Another just mayo and lobster roll, this one was not toasted or buttered. 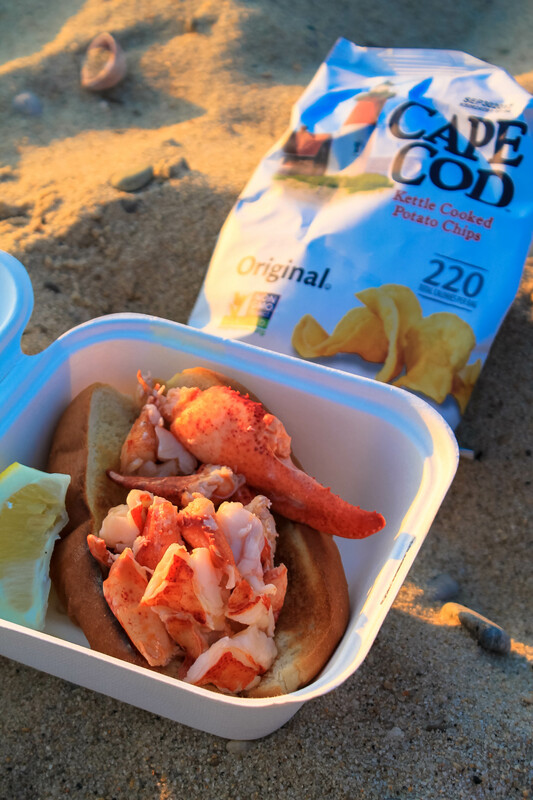 Served with the classic Cape Cod chips, we ordered our roll to go and the amount of lobster meat we received was enough to make 2 very generous rolls or three normal rolls – so even if you are going to just eat them outside, order them to go for that extra lobster meat! Up next, the lobster roll at John’s Fish Market in Vineyard Haven. Talking to Samantha, part of the family at John’s, she tells me the key isn’t just a toasted bun, but a HOT buttered bun with the cold lobster salad meat. They use Cain’s mayonnaise, extra heavy, in with the fresh lobster meat. Served with Lay’s Chips, this is a classic roll that you’ll enjoy. As the oldest fish market on island and now with its 3rd and 4th generation owned and operated, you’ll not only love the food here, but the familiarity. Everyone is family when they come through the door and everything in here is so delicious. My friend is addicted to their blue fish pate and I have to agree – it’s the best on island! And now finally, we head up island for the best sunset and lobster roll dinner you could ever have. I’ve had both lobster rolls at Larsen’s Fish Market and Menemsha Fish Market, and I love supporting both family owned businesses. 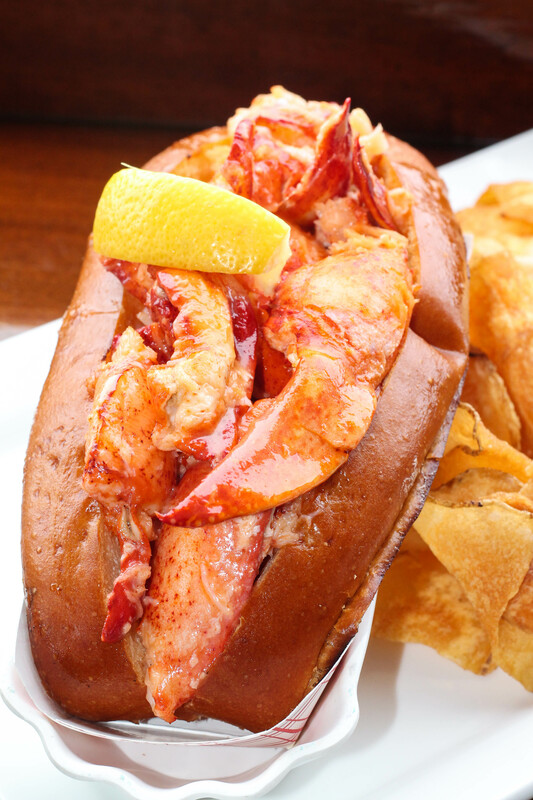 The rolls are pre-made if they are cold which is a great quick and go, but when you order the hot, which is pictured below, you get the special treatment of seeing your bun and lobster meat being doused with almost 2 ounces of melted butter. It’s a treat onto itself! Grab your lobster roll, a cup of lobster bisque or chowder, and head to the beach for the best sunset on the East coast. Happy Summer! This is not, by a long shot, a complete list of all the lobster rolls on Martha’s Vineyard. Every restaurant, shop, and snack bar has its own version of what a lobster roll should be. There are good ones and bad ones – I am only sharing the good ones because I don’t even want to share where the bad ones can be found! Please shoot me an email at marnely at gmail dot com if you plan to visit Martha’s Vineyard this summer and need foodie recommendations! Disclaimer: This was a very informal tasting of lobster rolls, throughout about a month. Some lobster rolls were comped by the restaurant, others were bought with my own money. Either way – I asked questions, tasted the lobster meat, the bread, the sides. This blog was brought to you by my tastebuds. Great blog on Lobster rolls! I too would put The Right Fork as my first. I would follow up with The Lookout as my second. However, there are others in your blog I have not tried, so I think it’s time for a Lobster Roll Stroll! Nothing like enjoying Lobster Rolls from around the island, great food, great views, great times! Thank you for the comparisons Mamely! Very nice to have this- as my friends have different preferences when it comes to hot,cod, toasted,B type and amount of mayo— question? which ones are fresh lobster – some were disappointed to get still a little frozen lobster roll at one of these locations in June. Will check out pricing as I follow your recommendations….. 👍🏽 thank you very much! I like menemsha fish market best so far! Thank you for the great article on places to get lobster rolls. I will be staying next store to Lookout for a week. Can’t wait to get my lobster roll. Great list! You made me hungry! I have to mention one of my faves – which I’m shocked isn’t on this list of the best – the hot and the cold lobster rolls from Net Result in Vineyard Haven. They are heavenly!